This elegant necklace has a sterling silver pierced open work pendant. The pendant is set with a marquis cut sapphire set in the center. 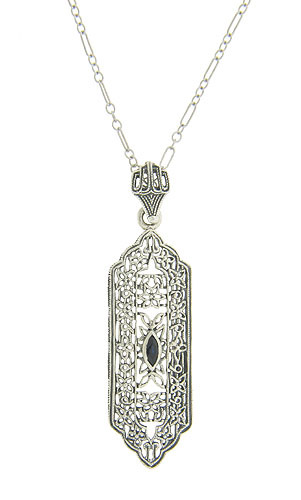 The antique style necklace is crafted of sterling silver and features an ornate organic design. The pendant measures 2" in length, 1/2" wide. The chain is 18" long.